In a couple of hours, we model a rough and fair (concept) design of any type of ship or yacht hull. Based on a sketch, pictures, linesplan etc, we use our in house Rapid Hull Modeling Methodology. When we have a conceptual hull shape in Rhino, we can also do fairing and preparation for manufacturing. This can include nesting and cutting files. We can also model, analyse and optimize ship hulls that are based on developable surfaces. At RhinoCentre we developed clever strategies to model a fair 3D ship hull, fast and accurate, based on your reference input. Your input can be for example: 2D linesplan, point cloud, offset table. 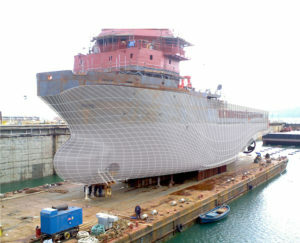 Especially when a hull is a standard design that has to be edited often for new requests, it should be parameterized. Only then, the overall dimensions and shape can be adjusted quickly while maintaining fairness. Please take a look at our demo at Rhinoceros Report. Please contact Gerard Petersen to discuss your needs.